I’ve used Modern Tribe’s Event Tickets Plus for a couple projects recently. It’s a great ticket selling plugin. But I found out that it doesn’t show Modern Tribe Event Tickets on WooCommerce Shop Pages. Luckily, there’s an easy fix. Event Tickets Plus, by Modern Tribe, is a plugin for selling event tickets. In order to sell tickets, however, you must also have WooCommerce installed. When you create a new ticket for an event, Event Tickets Plus automatically creates a WooCommerce product. By default, event ticket products do not display on the WooCommerce shop pages. This makes sense. For example, if you have an online store full of physical products like T-shirts and hats, you might not want event tickets to be visible. The following procedure explains how to configure event products so they appear on your WooCommerce shop pages. In order for this procedure to work, you must have WooCommerce and Event Tickets Plus installed. From the WordPress Admin screen, go to Products. Click the ticket product whose visibility you want to change. Select Shop and search results and then click OK.
Click Update to save the product. The ticket will now be visible on the WooCommerce shop pages. If you have already created dozens of tickets, there is a fast way to make them all visible at once. The Products listing page is displayed. Check each product whose visibility you want to change. 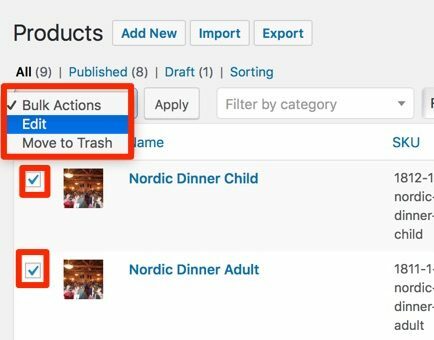 From the Bulk Actions menu, select Edit and then click Apply. The Bulk Edit screen is displayed. When you make a change in the Bulk Edit screen, the change is applied to all products you selected. 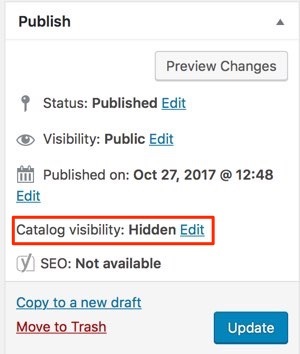 Under Product data > Visibility select Shop and search results. The visibility will be changed for all products you selected.